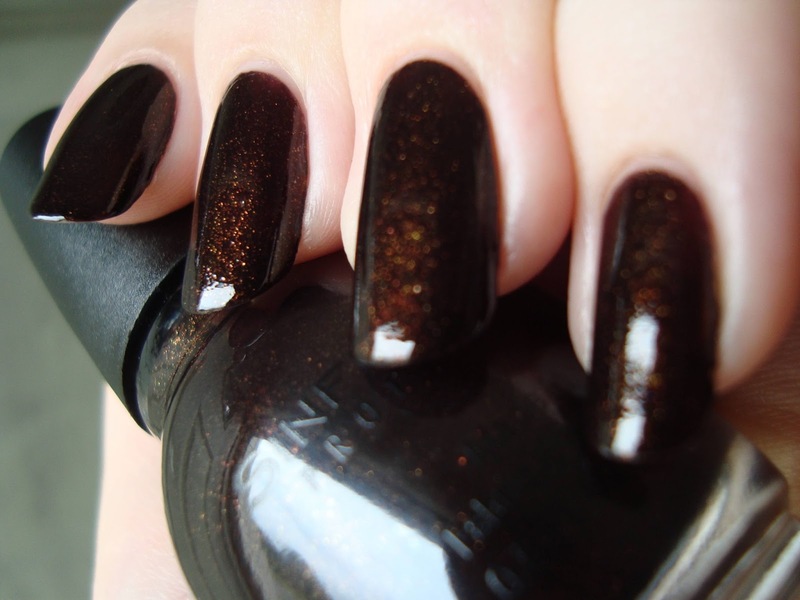 Leather Loose is a brown crelly with copper microfleck shimmer and it dries matte. I wanted Leather Loose soooooo bad from the moment I first saw it on Nouveau Cheap! If you shop at a certain Walgreens in the Philly suburbs and a brand new Leather Luxe display was mysteriously missing Leather Loose...I'm sorry...my fault! I bought all three. Two for me, one for my roommate. I couldn't love Leather Loose more and I knew it before I even wore it. It's fall in a bottle. Two coats apply smoothly and dry quickly. It's impressive "as is", but blows me away when it's top coated. It's like smoldering root beer, as weird as that sounds. Pretty, but just the start. The days have started getting shorter already (YAY!!) and I was losing the light a little when I took that photo at 6pm. The next morning I added another coat of top coat and took pictures in stronger sun. I think the extra top coat helped as much as the sunlight did. The microfleck shimmer means the top coat may settle and "shrink wrap" and not shine with its full potential. With the extra glossy finish, Leather Loose glows like sparks over a crackling fire and never fully loses its glow. 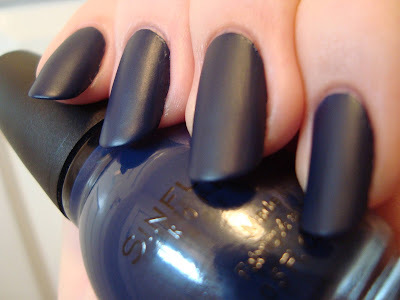 Cold Leather is a navy blue matte cream. Two coats on this one too, and it applied really nicely and evenly. The photo above shows the finish well, but isn't very true-to-color. The one below is closer, but really it's somewhere in-between. 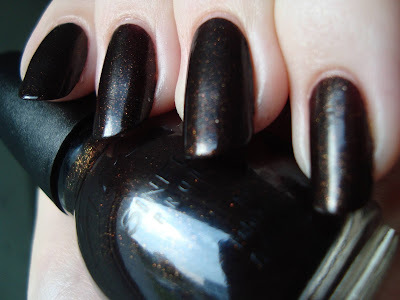 Cold Leather is darker than New Wave and I'll be posting some comparisons soon. I love how smooth the matte look is, but it's great with top coat too. I probably have something a lot like it, but...blue...cream....I can never resist. 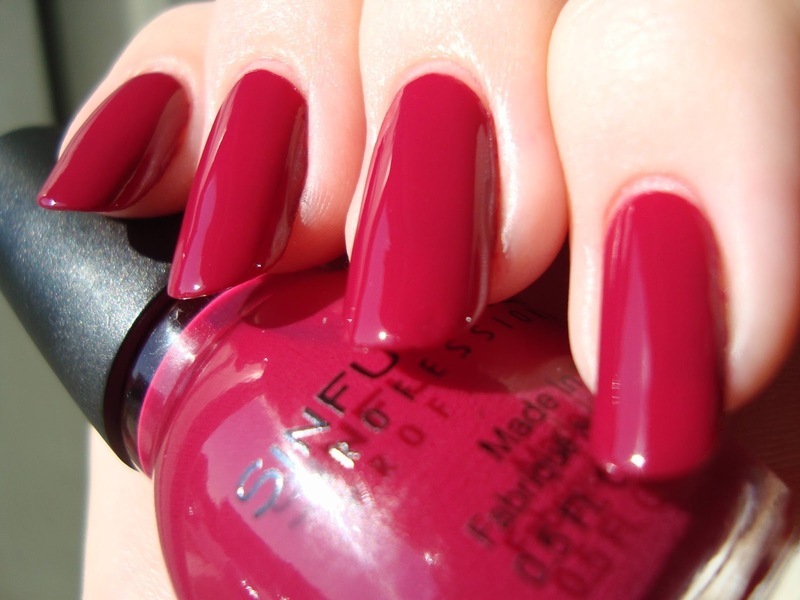 I can see myself reaching for this one in a hurry since it applies well and mattes are touch-dry almost right away. Again, the color in person is somewhere between these two photos, but closer to the one below. Strapped is a matte aqua cream. I love the color of Strapped, but the formula wasn't as good as Cold Leather. You can see the finished result is a little thicker. I needed three coats to even it out because it went on slightly thin and streaky. Workable, but not as easy as Cold Leather. Still, the matte finish plus the color...so soft, cool, and relaxing. With top coat it looks...familiar. I'm not sure what, but it reminds me of something. Maybe Rise & Shine without the shimmer. Suggestions are very welcome! Get It On is a matte berry cream. In bright sunlight Get It On reminds me of a darker, non-shimmery ManGlaze F--- Off & Dye. Maybe it's just that it's pink. That might be it. The formula's nice, but again not as good as Cold Leather. This is two coats, but there's a hint of streakiness. With top coat it's in the same family as Truth Or Dare, Berry Charm, and Aubergine, but I don't think it's an exact dupe for any of them. I'll have to compare them to be sure, but I think there's a warmer undertone to it. We'll see. It's beautiful anyway. I'm really falling to berry pinks! Bottom line: The finish is more matte than I expected and I'm pleasantly surprised. Leather Loose is amazing and you need it! The colors of the creams are very eye-catching, even if they're not unique. What cream is unique these days? Of the three creams I bought, Cold Leather had the best formula, but none were problematic. I hinted above that I'll be doing a comparison post soon. 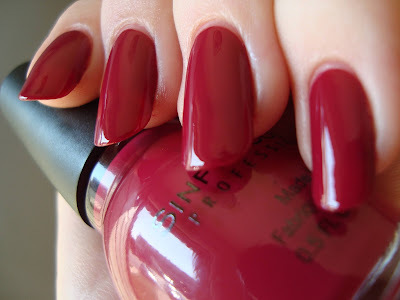 Are there any Sinful Colors comparisons you'd like me to do? I have a few planned already, but you can have a look at my extensive spreadsheet to see what I have. Tons. I have tons. Leather Loose is a STAR !!!! So,so,so pretty. It's the only one I picked up, I was shocked at how matte it is. I do hope they come out with some textured stuff soon. I have a bunch of the magnetics I got for 1.00 at Big Lots. They have some pretty shades. I love Leather Loose! I am waiting until the fall to where it. I also got Laced Up (beautiful orange red) and Cold Leather. 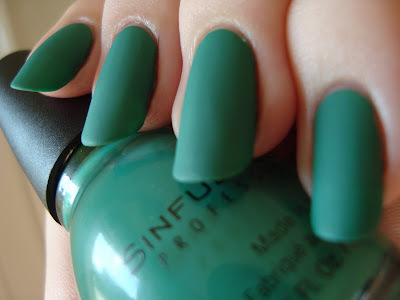 Great matte colors! i picked em all up except for the straight black one. last night i stamped with cold leather over an equally dark blue and it was AMAZING. so, they stamp too. at least the blue one so far does!